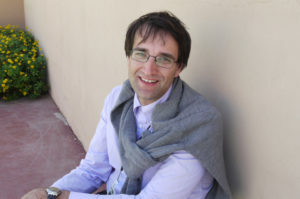 The 2017 French resident at Randell Cottage is Josef Schovanec, writer, polyglot and activist for autistic people who has published four books including Voyages en Autistan – Travels in Autistan (Plon, Paris) and Je Suis à l’Est !, the first memoir by an autistic person to be released by a major French publisher. His Randell Cottage book project focusses on developing a fictional narrative based on the story of an autistic friend’s journeys and research in the Pacific. Josef was born in 1981 in the greater Paris region to Czech immigrant parents. After completing a degree at L’Institut d’études politiques de Paris (Paris Institute of Political Studies, he studied Hebrew, Sanskrit, Persian, Amharic, Azeri, Azerbaijani and Ethiopian at the Institut national des langues et civilisations orientales (National Institute for Oriental Languages and Civilisations), on top of the Czech, German, Finnish and English, which he speaks fluently. His doctoral research, at the École des hautes etudes en sciences sociales (School for Advanced Studies in Social Sciences), investigated the success Martin Heidegger’s philosophy enjoyed in France. Josef Shovanec will arrive in Wellington in mid-January 2017 for five months. While in New Zealand, he will work on his next book and will travel on a speaking tour throughout the country.